A highly binding dummy template surface of molecularly imprinted polymers (MWNTs-MIPs) was synthesized on multi-walled carbon nanotubes surface using 2-phenylpropionic acid as dummy template, 4-vinylpyridine as the functional monomer, ethylene glycol dimethacrylate as the cross-linker, and DMF as porogen by precipitation polymerization method. MIPs were characterized by FT-IR spectroscopy, scanning electron microscope, thermo-gravimetric analysis, and nitrogen adsorption-desorption experiment. Adsorption and selectivity experiments of MIPs and non-imprinted polymers (NIPs) verified that the MIPs had a good selectivity and adsorption properties for five 2-phenylpropionic acid nonsteroidal anti-inflammatory drugs (NSAIDs). Imprinted polymer was used as a sorbent material for μSPE in current work and μSPE-DLLME method was selected for pretreatment of water samples. 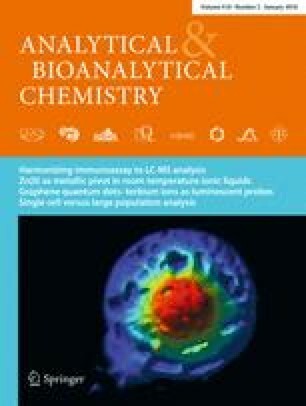 The μSPE-DLLME method was successfully used for the pre-concentration of five non-steroidal anti-inflammatory drugs in different environmental water samples prior to ultra-high performance liquid chromatography-tandem mass spectrometry. Efficiencies of μSPE and DLLME were thoroughly investigated and optimized in this study. The optimal results were obtained by using 3 mL of 1% formic acid-acetonitrile as elution solvent and dichloroethane and acetonitrile as extractant and disperser solvent, respectively. Limits of detection and quantification of five NSAIDs for different water matrices varied from 0.50 to 1.10 ng L−1 and 0.93 to 2.20 ng L−1, respectively. Each target analyte had a good linearity in its corresponding concentration range. Enrichment factors of target analytes ranged from 91 to 215. Recoveries of the target analytes were between 72.43 and 113.99% at the concentration levels of 0.02, 0.1, and 0.5 μg L−1. The developed method was successfully applied to extraction and analysis of NSAIDs in different water samples with satisfactory results which could help us better understand their environmental fate and risk to ecological health. This work was supported by the National Natural Science Foundation of China (No. 81503029) and Yong and Middle-aged Backbone Personnel Training Program of Shenyang Pharmaceutical University (ZQN2016011). The authors have declared no conflict of interest. The authors alone are responsible for the content and writing of this article.